iRocker has always been one of our top recommendations for people of all levels. However, we have never tried to compare this brand to the elite of the industry and see how it holds up. Actually, we did write an article comparing iRocker to Tower Padde Boards. However, we feel we have left out comparing iRocker to the other renowned iSUP brands, and well, we would like to redeem that. Indeed, iRocker is relatively a new face to the industry. Nevertheless, it has managed to make a name for itself in the iSUP industry in such a brief period of time compared to the ‘Pioneers’. That said, how did iRocker progress up the ladder and most importantly, how did it do so quicker than anyone else? There is a detailed answer to these questions but it can be summed up in three core qualities. First, iRocker’s boom is mainly credited to its consistent high quality products. Also, in order to cater for the market’s needs, iRocker had to invest in a rich variety of products. Finally, and this might sound a little exaggerated, iRocker has the best customer service reviews online. So, iRocker is definitely a catch but let’s see how good of a catch it is once compared to popular & equally prominent brands. iRocker All-Around • 10'6" x 33" x 6"
Since Tower is almost always amongst the elite, we thought we should initiate this Titan clash with two actual titans. Fortunately, however, we already covered this comparison with critical details in a completely separate article. So, feel free to check that out through here. While it might seem like a humble selection, ISLE is one of the few brands that invest in niches rather than create monotonous boards with no obvious purpose. 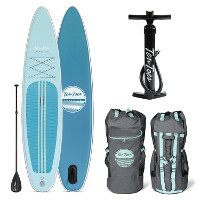 Hence, in this lineup, you’re going to find a fishing board, a touring board, an adventure board and more. Also, ISLE boards are lighter than iRocker’s quad layered build. However, iRocker boards are definitely made tougher and will outlast their competition easily. While it depends on the board, it seems that both brands are in agreement in terms of packaging. Indeed, both brands stick to a decent package that includes the necessary accessories to maintain these boards. Nevertheless, while ISLE’s Carbon fiber paddles are superior to iRocker’s fiberglass, the latter definitely offers a better manual hand pump. While characteristics matter, your wallet is often the call maker and it’s rather evident that iRocker offers better deals in general. Also, it is important to note that while ISLE iSUP come with a 1 year warranty, iRocker commits to its 2 years warranty and that goes to prove which brand you can count on to last longer. 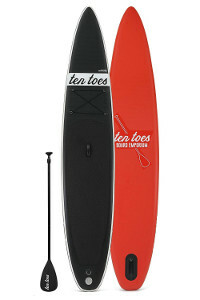 Packed accessories are definitely limited on Ten Toes boards to the basics. 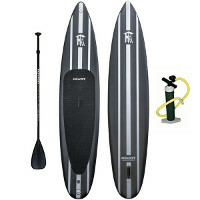 So, don’t expect anything fancy beyond the standard paddle, pump and carry bag. On the other hand, this humble pack is still considered rich in a market where most brands make you pay for accessories. As far as warranty is concerned, Ten Toes is still lagging behind iRocker due to its limited 1 year warranty. 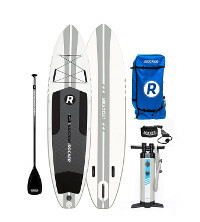 Thus, it is important that you get your board during an active season where you’ll get to test it to the fullest and assess it directly after purchase. In terms of pricing, it’s actually interesting to see iRocker coming in at almost the same price in every category. Indeed, both brands carry similar price tags (more or less) and that’s why you need a specific quality review to be able to make up your mind properly. 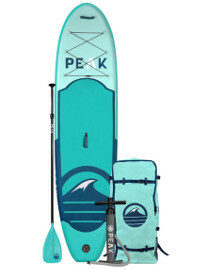 Peak has gained quick momentum compared to older brands and a majority of that effort can be traced back to their very accessible prices. 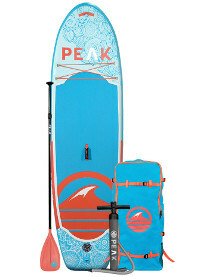 Not only that, but Peak also makes some of the best inflatable paddle boards out there. It’s a brand with enough integrity and variety to appeal to many people. Speaking of variety, here are the iSUPs they offer at the time of writing this post. Being an affordable brand is tightly aligned with packaging since nobody wants to buy a board and then buy all required accessories separately. 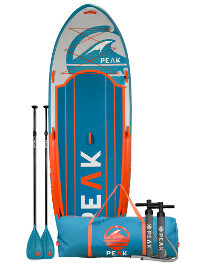 So, to make sure they maintain their customers, Peak does an impressive job with their packs, including pretty much everything you’ll need with an inflatable paddle board and at that they have a slight advantage over iRocker. It isn’t a shocker to see a budget brand sticking to a basic 1 year warranty. However, costing as much as iRocker for the most part, you’d expect them to match their 2 years warranty. 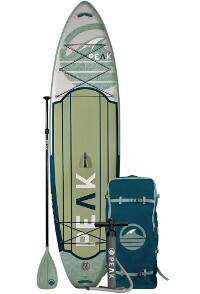 Nevertheless, Peak boards are noted for being developed for entry level paddlers and that entails a reliable resilience. 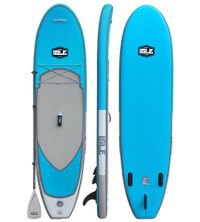 Nixy Manhattan • 12'6" x 30" x 6"
In order to match the speed of its competitors, including iRocker, Nixy had to make huge changes to their lineup. So, naturally, the first thing they thought of doing was to reduce the weight of their boards as much as possible in order to make transportation and manoeuver easier. Also, the brand offers a revolutionary look via blessing some of their backpacks with wheels. In terms of warranty, it was surprising to learn that a challenger like Nixy is up for a solid warranty. Indeed, it isn’t the habit for upcoming brands to push the bar higher on warranty life but Nixy interestingly matches iRocker’s 2 years warranty. While the quality of their boards differs from one product to another, both iRocker and Nixy boards are more or less equally resilient. Nonetheless, Nixy iSups are definitely lighter. Other than that, you can’t really go wrong with either brand since both share similar price tags and a solid sense of integrity. Thurso has got to be one of the most impressive brands on this list. Indeed, this manufacturer managed to integrate within a raging market and build a solid reputation in a short period of time compared to some of the pioneers. So, why is it taking them so long to enrich their lineup? Now, Thurso Surf is definitely doing better than many brands on this list in terms of variety but they’re still a little behind big names like Airhead & Aqua Marina. 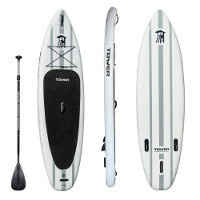 Nevertheless, warranty life is a category that Thurso Surf takes on with earnest passion. Indeed, this is one of the few brands that offer a 2 years warranty, placing it head to head with iRocker. Packaging is a double edged sword because it can often make or break a purchase and Thurso Surf is fully aware of that. 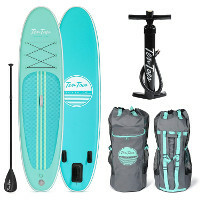 That said, this brand mastered the art of packing because they will include all the accessories you’ll need to maintain your board and enjoy your SUPing experience. 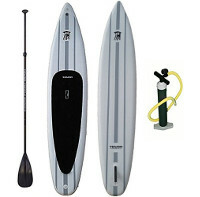 Nonetheless, it is important to note that Thurso Surf generic pumps received some criticism unlike iRocker’s triple-action pumps. 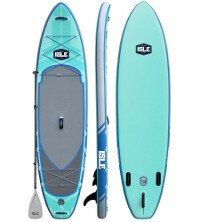 Since the brand’s headquarter is located in Canada, Thurso Surf’s boards are priced reasonably. 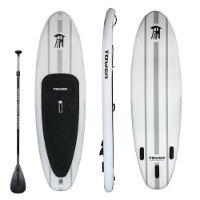 In fact, Thurso Surf iSUP boards are often far more affordable than iRocker’s and that lands the former a huge advantage. 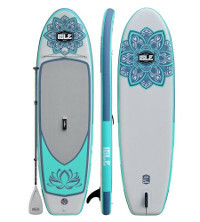 BlackFin is iRocker’s premium bliss, a model that has gained popularity quickly in the paddling universe for a number of reasons. BlackFin is pretty much the juice of whatever knowledge iRocker accumulated throughout the years packed into one line. Indeed, this collection relies on its impeccable features: stamped deck pads, dual grab handles, dual tie-down systems… as well as iRocker’s quad layer build. Now, it was expected to see these boards trespassing iRocker’s regular pricing range but it’s definitely an upgrade worth investing in. In fact, these boards combine the quality, rigidity and resilience of iRocker with an unmatched sharpness better labeled BlackFin. 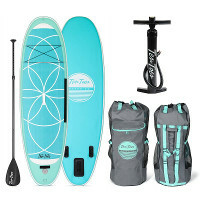 Thus, if you’re after a long lasting paddle boarding dream then you’re going to appreciate BlackFin’s stability, resilience and over the top accessory bundle. However, if you’re going on a tight budget then you wouldn’t regret investing in a standard iRocker. 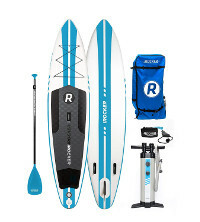 iRocker Vs. Red Paddle Co.
Red Paddle Co. is an a elite brand with an impeccable portfolio. So, naturally, the brand at hand features quite an impressive list of stand up paddle boards that is all inclusive and spectacular. When talking of quality, Red Paddle Co is undisputed because it adopts a unique technology in building their boards. Hence, Red Paddle Co’s advanced approach and quality measures determines a specific target audience that iRocker does not recognize. Hence, Red Paddle Co creates pro iSUPs for dedicated paddlers while iRocker is invested into initiating new comers into the sport and helping them improve gradually. On the down side, Red paddle Co. is known for their meagre packages that contain nothing but the board and a pump in most cases. Sometimes, they’ll throw in a paddle to push a board but you shouldn’t expect a rich pack from them in most cases. Since Red emphasizes quality to the extreme, it shouldn’t come as a shocker to learn that their boards are often above the $1,000 mark. 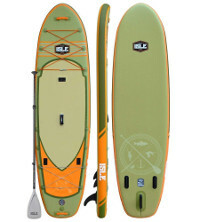 Indeed, this is an elite brand for elite paddlers and those who aren’t limited to a budget. Therefore, iRocker will definitely seem more appealing to most of us just based on the fact that it costs half as much. Affordability is almost always on the account of quality. Therefore, you should not expect this brand to match up to a Red Paddle Co. However, it does an impressive job compared to iRocker. 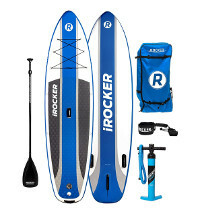 iRocker definitely has the edge with its quad layered iSUPs but Airhead iSUP boards are resilient and lightweight. Packaging is definitely a big deal for most paddlers which is why some of you might be disappointed with the fact that Airhead boards are generally shipped without a paddle. 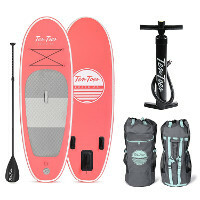 On the other hand, iRocker boards come in an all-inclusive package to ensure you got everything you need to get in the water and enjoy SUPing right away. Accordingly, since Airhead boards are less resilient, you’d expect a significant drop in prices when compared to iRocker. However, there is no clear advantage in popular boards; that is unless you want to go extra cheap and opt for a $200 Airhead at your own risk. In conclusion, this review goes to show exactly why we often recommend iRocker boards to our readers. iRocker is an impeccable brand that would help initiate you into the sport as it offers great quality for relatively affordable prices. However, it must be noted that once you try an iRocker it becomes rather difficult to make a switch especially knowing that it’s almost impossible to match their deals on the market.